Fancy living in future world today? Head down to Dubai in few years time. Dubai, the new booming emerging country already seeing ambitious real-estate construction activities which built Burj Al Arab, world’s tallest freestanding hotel in the world, and going to see world’s tallest building and the world’s tallest freestanding structure on land in Burj Dubai and Al Burj, are preparing itself to build more innovative skyscrapers which has futuristic and ahead-of-times building designs and architecture. 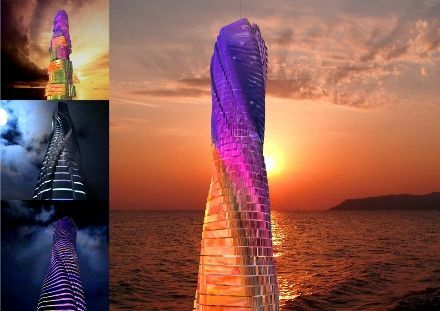 Dubbed ‘Rotating Tower in Motion’ building based on ‘Dynamic Architecture‘ concept by Florentine architect David Fisher is first of its kind and trend-setting. Not only be the pioneer, the Dynamic Architecture building which will constantly in motion changing its shape with each floor capable of spin, move and rotate 360 degrees independent of one another, will also be able to generate electric energy enough for itself as well as for other surrounding buildings from at least 48 wind turbines that fitted between each rotating floors as well as the solar panels positioned on the roof of the building that will produce pollution-free energy from wind and the sunlight. Any acoustics issues are solved by modern design of the building and the carbon fiber special shape of the wings. And the floor only rotates at the slow speed of about 6 meters a minutes, so that guests inside probably won’t feel it. 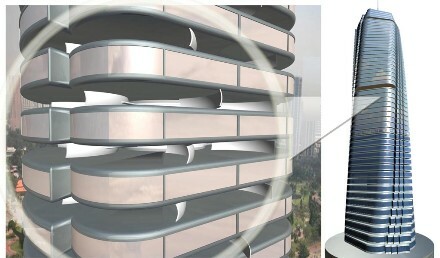 The Rotating Tower is actually a tower with a central concrete core surrounded by 59 independently rotating levels. It will also be the first skyscraper built with industrial systems process, where 90% of the building materials will be produced and constructed as modules in an industrial factory set up in Jebel Ali. These pre-fabricated units will then be shipped to the construction site and then assembled on the central core, the only part that will be built on-site using traditional techniques to house important static amenities like elevators, staircases, plumbing and other utilities. Each floor of the tower will consist of 48 of these factory-made modules that will arrive at the job site completely finished and self-contained with electrical, plumbing as well as air-conditioning systems ready for use. The modules will then be mechanically assembled at the rate of one floor every three days. 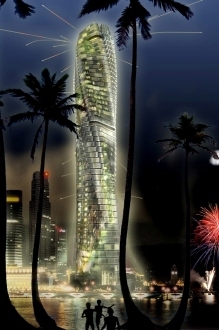 When completed, the rotating tower skyscraper will have 68 floors and will be 313 meters (1,027 feet) high. 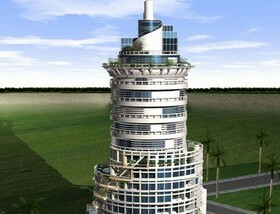 There will be a 6-star hotel, offices and apartments of various sizes besides five villas on the top floor. Each of the villas will have designated parking on the same floor with vehicles brought up and down in special elevators. The roof of the “Penthouse” villa will also have a swimming pool, a garden and an Arabian majlis. 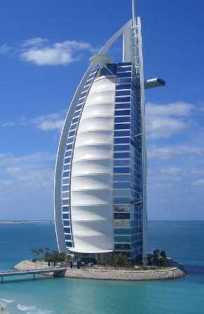 The tower also have a retractable heliport, a platform that will extend from the shell of the building at the 64th floor at the moment of landing, thus maintaining the dynamic aesthetic architecture of the tower. If you can’t visualize how the tower can have endless shapes by dynamically rotating floors to adapts to its surroundings but also to the tenant’s needs and the tenant’s caprices, the following video may help you. The Dynamic Architecture concept-based buildings are going to be built all over the world in cities such as New York, Milan, Moscow and Tokyo, after the project expected to complete in 2009 in Dubai, if it ever takes off. Here is a different conceptual design of Dynamic Architecture based on UFO theme. 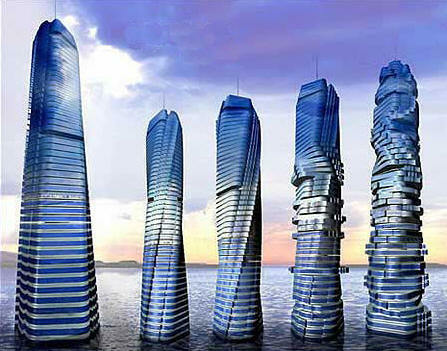 In fact, this is not going to be the only rotating skyscraper in Dubai. 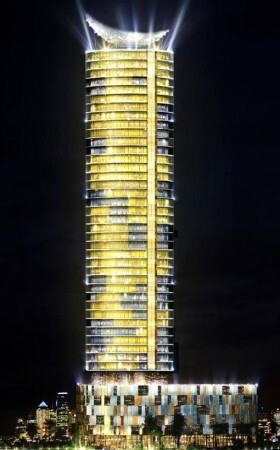 The Times Residences by Glenn Howells Architects is also a rotating tower with 200 condominium apartments that located in City of Arabia, and its rotation mechanism driven by solar energy. However, it’s not rotating individually by each floor, instead whole building rotate altogether to offer all residents equal view. Rotating speed is much slower at 1cm per min, making all 200 units able to view 360 degree of its surrounding once every 7days. This tower expected to finish in 2009. 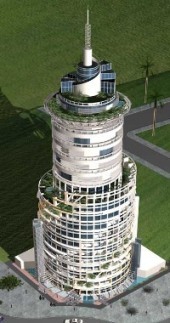 Rotating Residences is a tower project of High Rise Properties with four rotating penthouses and a rotating villa with its own car lift and 3 car pack space on top. There are total of 72 residential units. Five of the tower’s 15 storeys will rotate through 360 degrees at speeds which can be selected by the resident once in either 3, 6, 12 or 24 hours. Not futuristic and advanced enough? 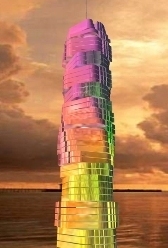 How about “Rotating City” urban concept, which will be built anytime soon on an island in Abu Dhabi. 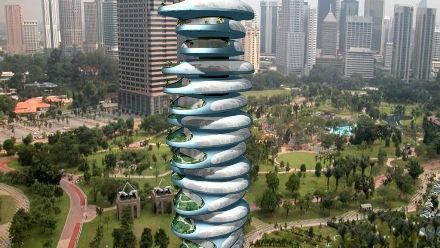 The Rotating City, also by High Rise RE, is a city project where every building rotates and faces different environments according to the owner’s wishes. At 10 million square feet, this city definitely has the closer look to Spaceport in Star Wars. The city will consists of 20 rotating building 300 revolving, floating and flying villas on the water, also able to rotate at wish. Inside the city there are also 5-star hotel tower with 300 rooms, 4-star hotel tower with 350 rooms and Attraction Park with an animation box, magic carpet, river adventure, conference room and wedding room.